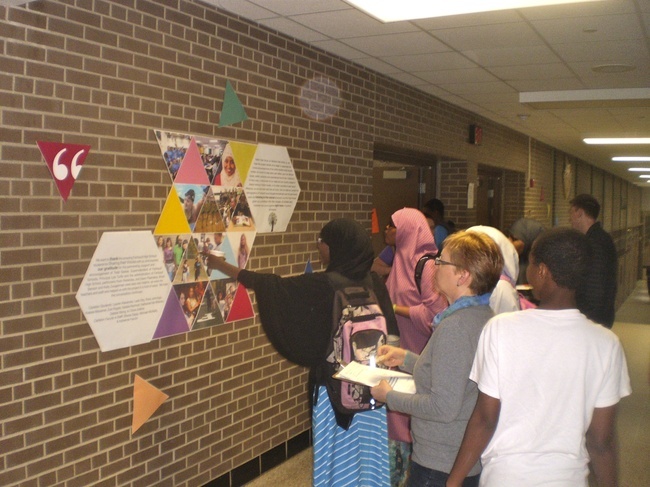 Students at Faribault High School view the exhibition, "Hearing the Voices: Celebrating Diversity at Faribault High School", Carleton College students created in collaboration with Faribault High School students and staff. This project began at Carleton College in Northfield, MN, in the winter of 2010. Students in two Religion Department classes, taught by Professor Shana Sippy, Encountering Islam: Dialogue and Difference and Modern Hinduism, began to do research on a number of current issues facing contemporary Muslim and Hindu communities within Minnesota. As an outgrowth of those projects, Professor Sippy began to offer the course, Seeing is Believing: Global Religions in Minnesota annually from 2011-2016. In addition, a course on Native American Religious Freedom, taught by Professor Michael McNally, which had been offered for many years, started to include a public scholarship component in conjunction with the project. These courses are connected to Carleton's Center for Community and Civic Engagement, which is committed to advancing faculty research and student learning that extends beyond the traditional classroom, working in partnership with local communities to make academic endeavors relevant, applicable, and accessible to larger audiences in the practice of Public Scholarship. This current website is the outgrowth of the work conducted in these courses, as well as completed and on-going research by Carleton College students and faculty. In addition, as a collaborative effort, Professor Sippy also offered in the Fall of 2013 at Macalester College, and this site includes the work of some Macalester students as well. Students in these courses have been involved not simply in reading historical and theoretical scholarship about religious life in America and among transnational religious communities worldwide, but they engage in a broad and impressive array of fieldwork. These explorations provide a picture of the range of religious diversity in the state as they consider communities in rural, suburban, and urban contexts, as well as the religious lives of those who have resided in the state for over a century or under a year. Currently, this research is nascent. In some cases, what found here reflects many years of research, while in others it may have been gathered over only a ten-week term. The project is indebted to the generosity of the religious leaders, communities, congregations, and individuals who share their knowledge and time to make this project possible. We are working to create an ever more in-depth dynamic site that can help to enrich public knowledge and literacy about the diverse religious worlds of MN. All of the research is edited, augmented and reviewed by Shana Sippy and Michael McNally. Our desire to create a website as one element of our larger public scholarship project was motivated by our belief that public discourse is elevated when cultural and religious literacy is prioritized. ReligionsMN, therefore, is one way that we believe that we can make knowledge about Minnesota's religious diversity accessible to a wider audience. Since the project began, students and faculty have been working to curate some of the rich history, stories, and voices that make up Minnesota's diverse religious communities. What is found here can only provide a small window into the worlds we feature in this initiative. More than anything, we hope that these portraits inspire people to explore and learn more about their environs, neighbors, colleagues, and classmates. As our communities have become more diverse, it is more important than ever that we are attentive to the ways in which difference is navigated. With this in mind, the Religous Diversity in Minnesota Initiative has worked with community partners—the MN National Guard, the Faribault School District, the Cambodian Buddhist community, and community leaders and educators focused on Somali Muslim Youth—to help facilitate greater awareness, conversations, and communication around issues of difference. We plan to expand these efforts in the months and years to come. None of this work would be possible without our community partners from communities throughout the state who have shared their lives, stories, sacred spaces, and insights with us. Some of them are named in the profiles of sites found here, others have chosen to remain anonymous. We are grateful to all of them.